The Porpoise and Oberon Class diesel boats were considered the best conventional submarines ever at the time. The Porpoise Class, built between 1954 - 61, was the first attack submarine design used by the Royal Navy after the Second World War. Although there were some technical and interior differences, from the outside both these classes looked almost identical. These Overseas Patrol Submarines, later known as Attack Submarines, were capable of great distances and could run almost silently. They were updated with the latest sonar equipment during the 1980s - this new technology easily spotted on their bows. They served the British Navy for well over a third of a century, the last of these submarines was decomissioned in 1993. 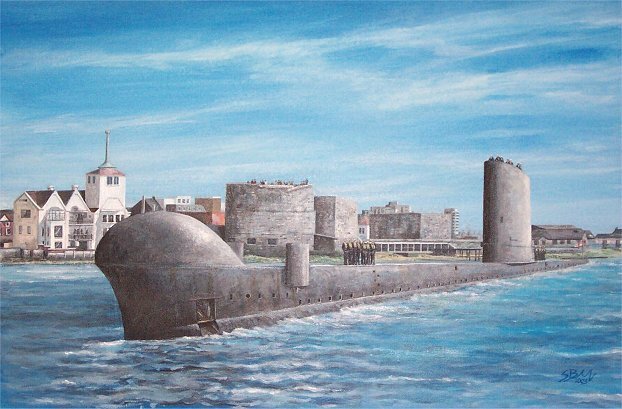 This painting was actually based upon HMS Opportune, an Oberon Class boat. She is seen here sailing into Portsmouth Harbour. Well-wishers wave from the Round Tower ashore whilst the crew stand respectfully facing the opposite shore - their base, HMS Dolphin in Gosport. This painting is priced in £ STERLING.